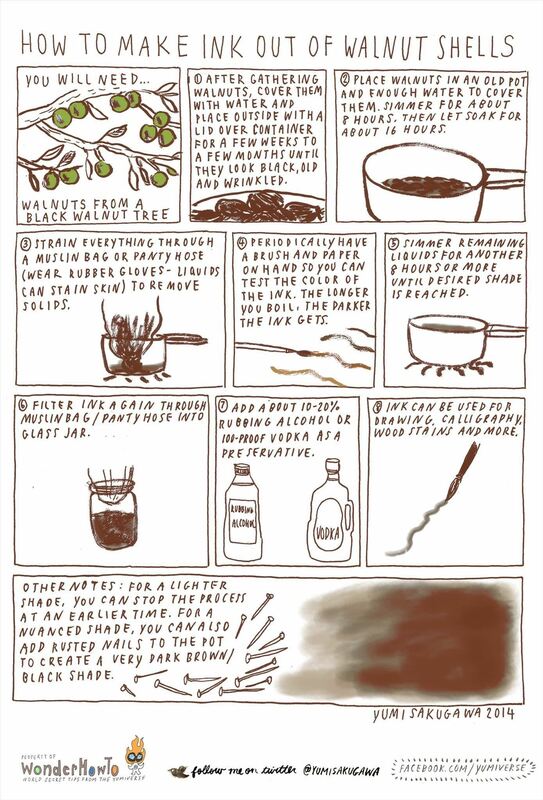 Using black walnuts, boiling water and a lot of time, you can make your own beautiful shades of deep dark brown to black ink for your next drawing, calligraphy, or wood craft project. Simply gather walnuts from a black walnut tree and let them sit in a pot of water outside (be sure to have a tightly secured lid or animals will get into it). Let them sit for a few weeks to a few months until the husks are soft, rotten, and black. Using an old pot that you no longer use for cooking food, cover walnuts with enough water and let simmer for eight hours. Strain through muslin cloth, let sit for a day, and simmer again for eight hours or until desired shade of color has been reached.